Yeah, it's officially "Silver Lake," but even many of its denizens spell it "Silverlake," which I find to be typographically more felicitious. And it sounds the same, so just close your eyes when you say it, if you're an administrative purist. 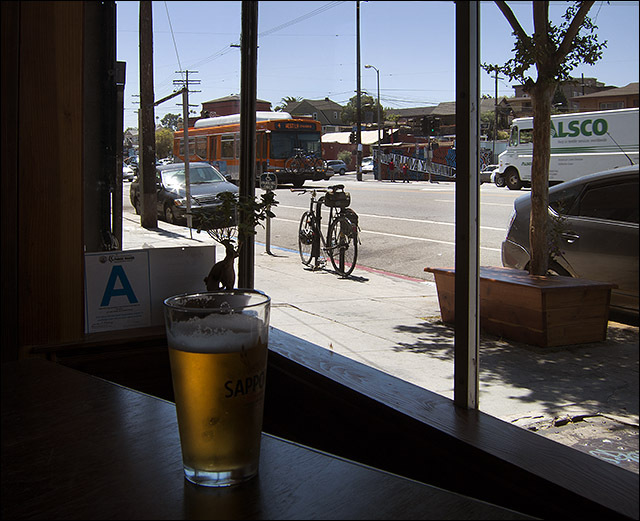 Which is to say, I've decided to initiate an irregular series of restaurant reviews, starting with Sunset Boulevard through that neighborhood immediately west of Echo park, and limited to establishments that qualify as bike-friendly, whether by intent or just circumstance. They won't be full-scale reviews, especially since as a vegetarian I won't sample the full range of wares at most places, and couldn't afford to anyway. But I can give an idea of the range of offerings, how good a meal or two I try there turns out, and whether the atmosphere is exciting, relaxing, homey, elegant, whatever. What the street life is like around each place, and what form the bike-friendliness takes. It's really just an excuse to eat out more, and a guide to those who need no excuse and are heading out to breakfast, lunch, or dinner on two wheels. This is cheating a bit, as I've eaten at its sister restaurants many times. I believe the first to be established was Via Café in Chinatown, with Blossom on Main Street following. The menu is the same in all three outposts, which is to say light but savory Vietnamese food, including curries, crepes, banh mi, Vietnamese coffee, and a variety of beers, including local brews and brews local to the folks back home in Ho Chi Minh City. The Silverlake outpost is on Sunset just west of Sunset Junction, just where the street life starts to peter out, but still within easy strolling range of the Junction itself, Sunset Triangle, dozens of boutiques, and a number of excellent bike shops, foremost among which is Golden Saddle Cyclery. The atmosphere inside is calm and unostentatious but elegant in a spare, subdued way, the staff is always competent, and the food is excellent. This time I ordered a rice noodle salad with egg rolls, a cold dish, as it was a hot day and I'd been riding for many long miles, and of course a most satisfying beer to go with it. In the past (at the other outposts) I've had the curry, the banh mi, and the sweet potato fritters, which are a sort of tempura but richer-flavored and more complex than the usual Japanese variety. Everything comes with basil as a garnish, and usually a bit of lettuce and some sprouts. Is it authentic? Probably—I was introduced to them by a Vietnamese friend. Oh, and the Silverlake restaurant has a stunning underground lounge that's open only in the evening. Said to be quite busy already. In another change of pace, I have posted a review of LA's bike advocacy OG Joe Linton's recent art opening, with an all-too-brief synopsis of the rest of the big man's life and work: Beyond the Obvious. And at Flying Pigeon LA I mix pleasure and complaint as I ponder how much more cycling we'd see if the city connected all the Bits & Pieces of its cycling network—though we're not doing too badly as it is. Just a little reminder that you might want to take a look at our Flickr set, To Live and Ride in LA, our ever-growing collection of photos of Los Angeles area bicycles, cyclists, infrastructure, and just plain things seen from the saddle as I pedal my way around the region, mile after happy mile, day after joyous day. And if you have a great deal more time on your hands, take a look at our collection of Flickr sets, with hundreds of shots of infrastructure in different cities, the various bikes we've assembled and ridden over the last few years, friends' bikes, ride shots, and pictures of all the CicLAvias so far. Publishers please note that we have high-resolution print-worthy versions of most of these images (especially more recent ones) available for publication upon purchase of one-time rights; please contact us through our comments form if you're interested. Our photos (and articles) have been published in a number of journals, including Cycling Mobility and Momentum Magazine. This week I wonder why LACMA doesn't put a bike corral by the new "BP Grand Entrance," seeing that the bike racks in front of its old main entrance are often packed solid: Museum Musings. And at Flying Pigeon LA I sadly return to an old theme, the persistent pothole at Fourth and Hudson, which threatens cyclists on one of LA's most popular bike routes. It's a diary of What Wasted Effort Looks Like. Yeah, it's officially "Silver Lake," but even many of its denizens spell it "Silverlake," which I find to be typographically more felicitious. And it sounds the same, so juxt close your eyes when you say it, if you're an administrative purist. This restaurant addresses a niche within a niche within a niche: it goes beyond vegetarian to vegan, and also serves all its dishes raw. No booze, but a variety of fruit and vegetable drinks. Also, no gluten. I am a fan of cooking; my wife's a gourmet cook, and I'm pretty good myself within a far more limited range. I love to throw plant bits into boiling oil, and I love baked goods. I've pretty much stayed away from raw-food joints so far, but decided to take the plunge with Cru. I ordered the pesto wrap, which comprises pumpkin seed basil, cashew cream (they call it "cheese"), greens (mostly kale), cucumber, garlic, avocado, sprouts, etc etc., wrapped in a collard leaf. Now, I do collards often, and collards can be tough bastards, but these folks have found the tenderest collards possibly in the universe, and the dish was excellent—satisfying and filling. There were some "dehydrated flax chips" in lieu of bread, and they were good too, albeit not crispy. I was impressed enough I'll be back there soon. But vegetarian, vegan, or not, I think you'll like the food. Everything else on the short but thoughtful menu looked appealing—check out the website through the link below. The ambience is casual-elegant, the waitress friendly, forthright, and competent (and a daily cyclist), the noise level at lunchtime low enough for meetings or romance (she did say it gets quite busy at night). There's a coffeehouse next door if you want something hot with a kick for after dinner. And it's right on Sunset Triangle, that newly-reclaimed bit of street wehre Griffith Park Boulevard eases into Sunset itself--meaning it's at the intersection of two bikeways as well. Outdoor tables, good neighborhood folks hanging around, and plenty of bike racks to keep your wheels safe. They feed the good folks at Golden Saddle Cyclery now and then. Try it out. They may even be considering a promotional discount for cyclists. Tell them you rode in when you go there, to give them a bit more incentive. 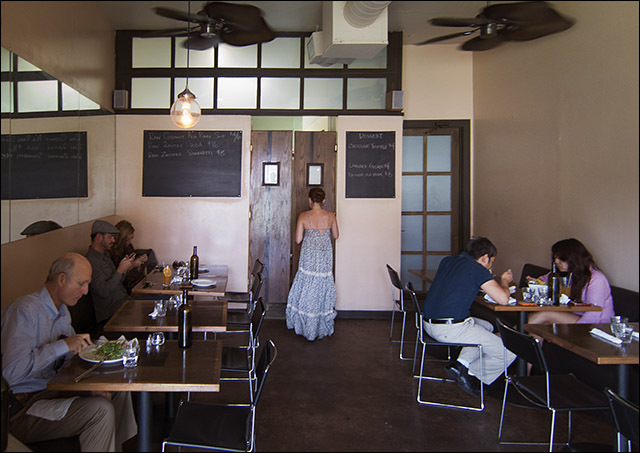 Note: Although Cru's website is still up, the restaurant appears to have closed. At Orange 20, I go off on a Half-Baked intersection treatment at the gleaming new Expo Line station gracing La Cienega and Jefferson...but oddly favoring cars over every other mode for getting to the train. And at Flying Pigeon LA I rag on fiscal hypocrisy among our brothers and sisters on the right wing, who hate to spend tax money on bike paths, but love socialized parking...well, I say Privatize This! CicLAvia Returns to Los Angeles on 10/7/2012! CicLAvia, a nonprofit organization with the purpose of promoting and planning car-free street events, announces that its fifth event will be taking place on Sunday, October 7, from 10 a.m. to 3 p.m., with new route extensions into Chinatown, South Los Angeles, Exposition Park, and Boyle Heights. The six hubs along the CicLAvia route, five of which are new this October, are each situated in the heart of a unique neighborhood and located near public transit: MacArthur Park; Expo Park on Figueroa; newly built Grand Park, Chinatown; Mariachi Plaza de Los Angeles and Soto Station in Boyle Heights. This has always been a wonderfully, often ecstatic, experience for LA's car-trammeled residents, and many people undergo an epiphany simply from seeing what our city looks like when you aren't shielded from its multitude of curiosities and delights by walls of glass and steel. The new routes, anchored as they are by rail transit stations, make it possible for LALAlanders to forego the car entirely for a day, yet see more of their city in a few hours than they may have done in years of driving. For more information, see the CicLAvia website. 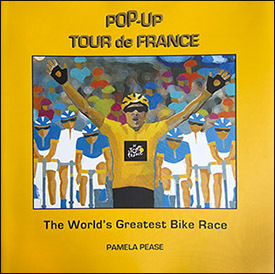 Book Review: "Pop-Up Tour de France"
Bicycle Fixation's trusty right-hand woman, Gina Morey Risemberg, reviews a clever approach to familiarizing newbies with the Tour de France: a pop-up book! This delightful volume includes hefty doses of history—both of bicycles in general and of the Tour itself—and explains present-day race culture, rules, and techniques, as well as the culture of the teams themselves. Kids and adults alike will find this book as useful as it is enjoyable, especially if they are encountering the race for the first time. 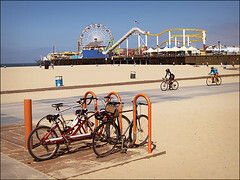 Okay, I'm leaving Santa Monica alone this week—they can't get all the attention! Closer to home, I complain a bit about the 90210 and how Bev Hills seems to have Lots of Dollars but No Sense, as they steadfastly stiff any hopes for effective bike infrastructure but continue to our money into subsidized parking that only further clogs its palm-lined avenues. fortunately, I find some relief in noticing how we cyclists are Not So Special Anymore in South Pasadena and environs, as more and more regular neighborhood folks start to hop on bikes for local travel. Beverly Hills many be retrograde, but the rest of the county is waking up to the Bicycle Millennium! Bicycle Fixation reviews the famous Brompton folding bicycle. We borrowed a couple of Bromptons to take with us on a train trip to Denver and San Francisco, giving us an excellent opportunity to test the quirky little British folder as a travel bike, as a multi-modal commuter in transit in two cities, and as just a plain bicycle bot him city traffic and out on long cycle tracks. The bikes did wonderfully, and made our trip much easier and more pleasurable that it would have been otherwise. 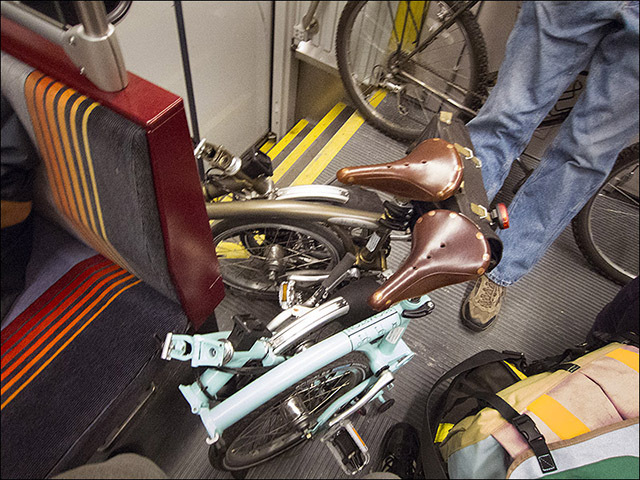 We rode to shopping and dining, we rode for pleasure, we rode to meetings, we loaded the bikes on trains, trams, buses, and in cars, and stuffed them under tables and into closets, and...well, here: read the full story now on Bicycle Fixation: Know When to Fold 'Em: the Brompton.